Can you believe that this plant can kill and eat a sheep? A huge plant that captures and feeds with sheep, first appeared on the arid fields of Chile, where it adapted to harsh conditions. 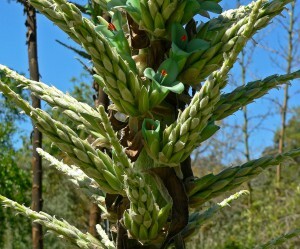 The plant is called Puya chilensis and feeds on the nutrients in the body of the sheep. 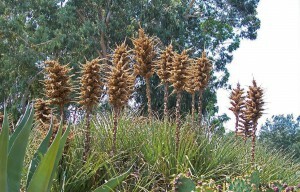 Giant plant has a height of 3 meters and has huge spikes with their prey. Once captured, the animal can not escape and dies of starvation. The plant feeds on nutrients in animal bodies. 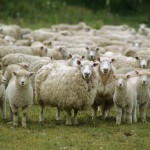 The sheep are the main target of Puya chilensis, since their fur is very easy to catch the plant spikes. Because it uses this practice it’s considered a harmful plant and this is why the shepherds are burning them to protect their flocks .. Although it appeared inside a garden, plant habitat was expanded to the Andes mountains, where it has become a real threat. Puya chilensis is very difficult to keep in captivity because of its way to feed themselves. Experts say that the plant contains enough nectar to satiate a person. What do you think about it, would you be afraid if you see it in the garden?